Mika Hunter Twietmeyer teachers Biology at Riverside High School in Durham, NC. She is Durham Public Schools’ 2019 Teacher of the Year. Teaching a sheltered ELL class can be a little unnerving, especially for a new teacher. However, some of my fondest teaching moments have been made while teaching ELL Biology classes. In this post I will share some practical information and some tips that can guide you while teaching ELL students (in a sheltered class or within a mainstream class). My first piece of advice, just like any class you are going to teach, is to build strong relationships with your students. Capitalize on the potential diversity in the room! Definitely take extra time at the beginning of the course to find out about your students, where they are from, and what type of educational experiences they have. Some of the students in my classes had large gaps in their educational histories and it was important for me to reinforce basic classroom processes and procedures. For example, I found it really helpful to create a weekly calendar for my students and focus on organization and maintaining a organized notebook. It’s also helpful for students to feel confident with the everyday workings of your class. Imagine walking around a school, not being able to understand the words on the walls or the morning announcements. Very intimidating! To combat this I have a fairly standardized schedule – Mondays we work on vocabulary, Wednesdays we write about current events, and Friday we have a weekly quiz and a learning celebration. Vocabulary skills are key! Just like in any science course, there is a ton of terminology to learn and remember. Using multiple formats for students to understand key terms is crucial for your ELL students. I create weekly vocabulary packets that have pictures and key root words. Most ELL students are able to use bilingual dictionaries on their exams, yet most students are not sure how to effectively, and efficiently, use a dictionary. This is a skill that is important for students to develop, and is a great skill to practice during weekly vocabulary activities. One of my guiding principles when teaching ELL students, especially a sheltered class, is that the course is going to look different. And that is true for many aspects of the class. Although you will be following the same standard course of study, and likely have the same state testing requirements, you need to meet your students where they are and think about the most important aspects of the content for your students to understand. When I teach ELL Biology the students have typically been in a US school for less than 3 years. I do not expect them to show me their understanding in the same way that my native-english speakers will. This guiding principle is something that teachers should consider when approaching ELL learners. This doesn’t mean lowering expectations for your students, it means being realistic about how you approach their learning objectives. Knowing this, I aim to provide multiple avenues for students to show me they know the content – even if it means asking students to speak or write in their native language. One form of assessment that I utilize in my ELL classes is small group discussions. I provide small groups of students questions at the beginning of class and allow them time to work with their peers to develop answers. I circulate around the room from group to group asking the students one question at a time. If students are able to communicate the scientific content they are learning in any language I am confident they are meeting my learning objectives. I make time to celebrate as many small victories as possible. Every week we celebrate the students that turn in all of their assignments, have the most improved quiz grades, and other classroom successes such as best team leader. However, it’s important to stay away from making learning a competitive sport, which can be challenging when test scores and proficiency are often communicated as the most important thing. My final suggestion is that you find the confidence needed to support and defend your ELL students. Don’t assume that students are talking about you if they speak to each other in their native language. Ask for the support you need so that your students can find success at the level that is appropriate for them. Develop relationships with your students and show them that you are proud of their achievements even if they aren’t measured by a standardized test. 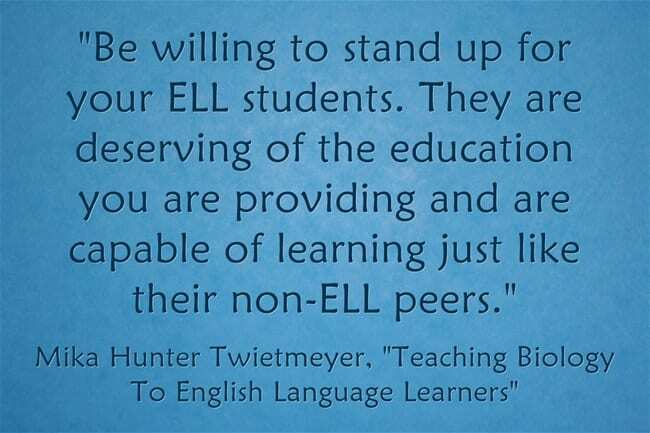 Be willing to stand up for your ELL students. They are deserving of the education you are providing and are capable of learning just like their non-ELL peers.